I’m not going to make it a habit to post about Buffalo theater, because reviews per se seem to be a bit of a conflict of interest. 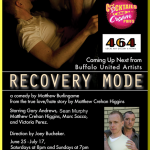 I do want to post about Recovery Mode, playing one more weekend at Buffalo United Artists because it struck me as different, even as it felt very familiar. As a relationship tale, it doesn’t deliver anything new, but it delivers it with such heart and with such unabashed honesty and gut-busting humor (there is one line that is so funny, the actors onstage aren’t even acting) that it deserves a shout-out. Actor/playwright Matthew Crehan Higgins, who bravely stars in the show as himself, originally conceived Recovery Mode as a one-man show, which was recorded and distributed worldwide as part of Cocktails and Creampuffs, a top-ranked LGBT podcast. From there, Sacramento playwright Matthew Burlingame picked it up, and asked Higgins if he could dramatize it as multi-character play. Higgins agreed. The show opened in Sacramento before moving to Buffalo, where Higgin’s Cocktails and Creampuffs partners and pals–Joey Bucheker and Marc Sacco–became part of the project, Bucheker as director and Sacco playing a friend that is a composite of both himself and Bucheker. Sean Murphy takes on the roles of Higgins’ diversions and Victoria Perez smartly and hilariously prevents a therapist-in-a-chair role from turning deadly. Musician Gary Andrews, lead singer of Kamikaze LTD, makes his stage debut as Tom, the object of Higgins’ love/hate attention. Recovery Mode isn’t perfect. At its heart, it still reads essentially as an accessorized one-man show. It would benefit from some judicious editing, particularly in Act 2. Tom isn’t developed enough, despite a great directorial choice to let him sing one of Andrews’ original pieces. And you won’t walk away with any real insights into relationships, or asking yourself burning questions that will keep you up at night–unless it’s why, why, why did he stay with that man? But that’s just it: For anybody who’s ever suffered the frustration of being somebody’s transitional relationship, the show elicits empathetic understanding that underscores Recovery Mode’s authenticity. (For some Buffalo audience members, the show was so real that they know Tom’s true secret identity… and probably still bump into him at the gym from time to time). The chemistry between real-life best friends Higgins and Sacco (one of Buffalo’s finest actors) only adds to the show’s realism, and it’s this combination of factors that make this show special and worth seeing.